It was one of the last pictures ever taken of Christian Garcia. With the sun on his face, the Santa Fe teenager leaned his head on the wooden slats that would one day be his bedroom. On the framing of the house he'll never live in, Christian had taken a sharpie and written Psalm 46:10: "Be still and know that I am God; I will be exalted among the nations. I will be exalted in the earth." Today, those words echo across a Texas town in desperate need of the reminder that God is still there. For the 10 families who never dreamed they were saying their last goodbyes Friday morning, the pain of another school shooting is a raw and profound reminder of how desperately our world needs the Savior. Wrapped in a grief familiar to too many communities, a heartbroken Santa Fe turned, as it always has, to faith. Moments after the first shots rang out, phones started buzzing. "Please pray," came one text after another. 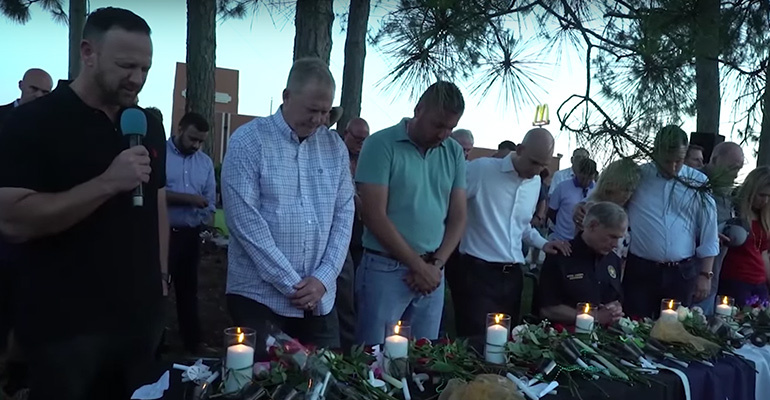 Cars started to pour into church parking lots; prayer chains sprang into action. In a city that just survived the worst of Hurricane Harvey, everyone knew what direction to look in tragedy -- up. Now, as the first bodies of those eight students and two teachers are laid to rest, America returns to the question burned on everyone's mind: why? Angry outsiders demand gun control. Others lay the blame at the feet of the NRA. And while the rest of the country debates what our country could have done differently, Texas's top officials try to return the conversation back to the heart of the problem -- the heart. "We have devalued life in this country," Lt. Governor Dan Patrick said plainly. 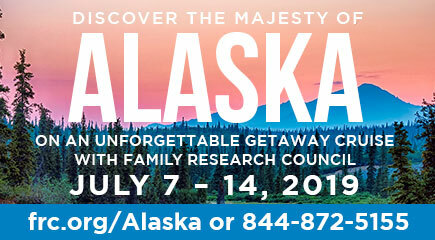 "We threw God out of school... We have families that are broken apart, no fathers at home. We have incredible heinous violence as a [video] game, two hours a day in front of their eyes. And we stand here and we wonder why this happens to certain students." In Sunday services across Texas, teary parents seemed to have the same response. At Arcadia First Baptist Church, one grandmother's eyes welled up just thinking about her grandson, who was supposed to be in the art room where the shooting started. "We need God back in our schools," she said. For Santa Fe, where students still pray before football games and some teachers still hold lunchtime Bible studies, "thoughts and prayers" aren't throwaway words when heartbreak strikes. They're a way of life. "This is not," Patrick insisted, "about guns. This is about us, as a culture and a nation. Who are we?" "The nightmare we have lived since the turn of the previous century has been the direct result of the world's rejection of God. We fled from His embrace and what we found out here in the wilderness, in our 'freedom,' is evil and despair on an unimaginable scale. We have become an empty country, an empty generation, an empty world. 'They withdrew from me, went after emptiness, and became empty themselves,' God says through the Prophet Jeremiah. He speaks as much to us as He spoke to the people of Jeremiah's time." Of course, some liberals don't want to have a discussion about the underlying problem, because it would mean acknowledging the fallen nature of man. That, not stricter gun laws, is what's keeping us from finding real solutions as a nation. We can talk about limiting access to guns, but if we're truly concerned about violence, let's also talk about expanding access to God. Until we're willing to address both -- the instrument and the motivation – nothing will change. A spiritually sick society that embraces violence instead of values needs God. Maybe a community as deeply sincere about their faith as Santa Fe can help the nation understand that. Looking across the rows of empty school chairs, they know better than anyone -- Guns don't steer men wrong, hearts do. 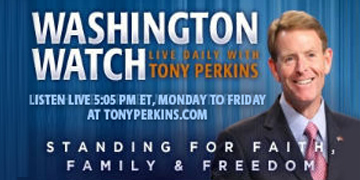 Tony Perkins' Washington Update is written with the aid of FRC senior writers. A Pop of Colyer Protects Adoption in Kans.